ABDOU SARR, an ARTS ARE ESSENTIAL, Inc. artist, has one Hartford Performs program: WEST AFRICAN DANCE and CULTURE. ABDOU SARR is a dancer from Senegal, West Africa, living in Western Massachusetts. He is extraordinary, dynamic and very engaging. He sews his own dance costumes. Abdou speaks English fluently and is currently dancing with highly respected performing groups in Massachusetts who do arts in education programming: Tony Vacca's World Rhythms and Bamidele Dancers and Drummers. 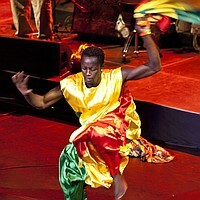 Since his arrival in the US in 2000, he has been busy dancing, making Senegalese clothing, taking additional English classes, raising a family, helping his family back home and traveling with World Rhythms and Arts Are Essential, Inc. for the Senegal America Project, a cultural educational exchange program. Abdou is a highly charismatic young man. He is very responsible and an excellent role model for our US youth on Africa, Senegalese culture, Muslim religion and the arts. Abdou is a master teacher of the sabaar and djembe dances from Senegal. He loves to share Senegalese dances and culture. The students will become proficient in the dances and will be able to perform them for their peers.